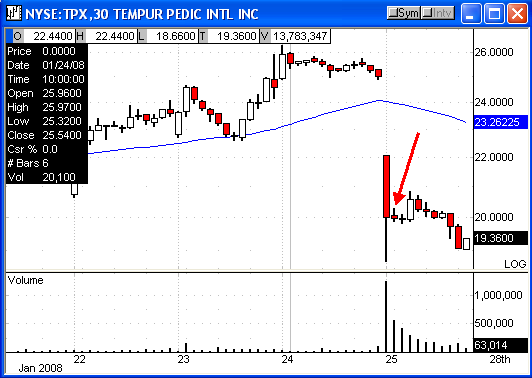 I took two short trades in TPX today but the market didn’t seem to care too much. I was stopped out of both of them. There is a growing mountain of evidence in my StockTickr reports that tells me I should not take trades on days where the market gaps by a large amount at the open. I’ll devote an entire post to this theory sometime soon. No such luck either time. Hopefully you guys made a killing! 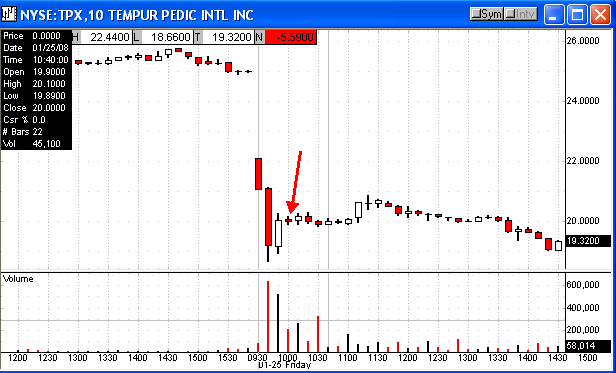 I think that your 30 min TPX trade has nothing to do with the gap open. That stock had it own mo. It even gaped down while the market up. The big red flag for me was the long tail that had in the 2nd 15 min bar. I found that big gap days that reverse wipe out most of my stock on the wachlist like tuesday and friday. The thing is that the reverse in this two days were too strong. It do not happend that much. I wasn’t implying that the TPX trade failed because of the gap open. What I was saying is that there is a pattern I’ve found within my trading that overall on days where the market gaps up my system underperforms. It’s just a matter of me resisting the urge to trade on days like this.